Lake Garda Coastline, Captured From Desenzano, Brescia, Italy. 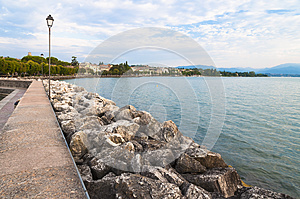 Photo title: Lake Garda coastline, captured from Desenzano, Brescia, Italy. Lake garda coastline view. Captured from the touristic city of Desenzano del Garda, Brescia, Italy at early morning. Taken on 15, 2016.